As reported in this column recently, a new line is being built in the AAT factory on the Eastern Seaboard for the B-Car of Ford and Mazda. It was known that the Mazda model was going to be the Mazda2, which had already been released in Japan; however, the Ford variant was still being kept under wraps, but was rumoured to be the secret new Fiesta. Ford has now admitted that their new B-Car will be seen at the Geneva Motor Show and has released images of the new vehicle. As expected it follows the concept Verve B-Car which was shown in Frankfurt last year and Detroit. Production of the new model gets underway in Ford’s Cologne plant in Germany around September, and there will be a second assembly plant in Spain. Ford will also make an announcement about an Asian Fiesta production facility at the Beijing show in April, and put your money down on this being Thailand, though another factory in China could also be on the cards. The new Fiesta is based on the same platform as the new Mazda2 but everything from the door sills up is Ford. It will be offered in Europe with a choice of five petrol and diesel engines. In Europe it will be offered as a three door, but the car that will be built here will be in four and five door formats without the three door variant. The Fiesta name has been used before in world markets, but was always a boxy ugly duckling. This is not the case this time around. Unfortunately, our local Fiesta will not be available until early 2010, while the Mazda2 is scheduled for the end of 2009. Judging by overseas reports, both these cars are worth waiting for. Ford says the new model brings a host of big-car features to Fiesta for the first time, including a driver’s knee airbag and an integrated “HMI” center stack inspired by mobile phones (I can hardly wait), housed in the latest iteration of the Blue Oval’s “Kinetic” design language. Unfortunately, Ford comes up with these buzz-words, which mean very little to anyone else! Remember the last major styling cue which was called the “edge”? These seem to come from the Ford design studio which is headed by a mysterious chap by the name of J Mays. Nobody gets to know what “J” stands for, as it appears to be a tightly held Ford secret! 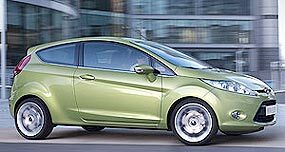 The new Fiesta will be a ‘world car’, designed and developed in Europe for sale in Europe, Asia, South Africa, Australia and the Americas between 2008 and 2010. This new Fiesta is the first major product of Ford’s new global product development process. “This new car embodies the very essence of Fiesta - fun, vitality and emotion,” said the president and CEO of Ford of Europe, John Fleming. “We know there isn’t a better name for the new model, and we have over 30 years of investment in the Fiesta brand to consider.” This means that your old Fiesta baseball cap can be brought out from the back of the cupboard! “We’re confident that the combination of dynamic new ‘kinetic design’ exterior, great interior design and craftsmanship, and a host of new technologies and features will provide compelling reasons for a new generation of customers around the world to take a fresh look at the Ford Fiesta,” said Mr Fleming. Unlike four door sedan versions of the new Fiesta destined for Asian and US markets, European production of the Fiesta hatch commences this year at Cologne in Germany. European production will later be ramped-up with additional capacity to come from Ford’s Valencia plant in Spain in 2009. The new Fiesta retains its predecessor’s MacPherson strut front and twist-beam rear suspension but gets Electric Power Assisted Steering (E-PAS) for the first time - a move that is claimed to contribute to a lower overall weight. The five engines available in Europe include a more powerful 86 kW version of the Duratec 1.6 liter ti-VCT petrol four and a 50 kW Duratorq TDCi diesel that produces less than 100g/km of CO2 emissions. A 1.4 diesel and 1.2 and 1.4 liter petrol fours will also be on offer, also mated to five speed manual or four speed auto transmissions. New Fiesta technology includes keyless starting via the ‘Ford Power’ push-button, which is another of the ‘trendy’ ideas that I thought we had managed to grow out of when they invented key starting. Now you have to put the key into one slot and then push the button. Ah, retro engineering, I love it! The Fiesta also will have Ford’s Easyfuel capless refueling, USB connectivity and ambient interior lighting (whatever that is). Ford Australia spokesman said that the Fiesta would be sourced from Thailand when the next generation model comes on stream in less than two years. Ford Australia will be able to take full advantage of the free-trade agreement between Australia and Thailand, and should also benefit from the two countries being under the same Ford regional umbrella. The Ford Australia president also spoke on the Ford Motor Co and Mazda Motor Corp joint venture that will see more than $A560 million invested in the new production facility in Thailand. This was reported in this column a couple of weeks ago. According to a Mazda statement, the facility “will incorporate Mazda’s production methods into each stage of the production process,” which should ensure Japanese standards of quality. It also mentions the assembly of passenger cars rising up to the midsize CD-segment, opening speculation that small car based vehicles such as the new Ford Kuga SUV or its derivatives may also be built at AAT in Thailand. Production capacity is projected to be 100,000 units per year, adding to the 175,000 light trucks - chiefly the Ford Ranger and Mazda BT-50 - the AAT plant currently assembles. Mazda Australia is also now expected to switch its production source of the newly released DE-series Mazda2 from Japan to the new Thai site from 2009, a move made possible because the light car was co-developed (in Japan and Germany) with the next-generation Fiesta. Ford Australia’s president said he had absolutely no concerns at all with quality, as there have been no issues with any Thai-sourced vehicles to date. In addition to the range of Japanese one-tonne pick-ups built in Thailand for Australian consumption, Honda Australia uses it as the production source for most of its volume-selling passenger cars, including the Jazz - a key Fiesta and Mazda2 rival. New Zealand, South Africa and other ASEAN (Association of South East Asian Nations) destinations are also set to receive the next Fiesta from Thailand, while plants in Germany and Spain are expected to continue supplying Europe. All in all, a great pat on the back for AAT in the Eastern Seaboard, and it looks as though AAT will be busy for a few years yet! Last week I wrote that the first Citroen 2CVs came in one color only. I asked what was it? And it wasn’t black! It was grey! The epitome of everything British (but German owned) automaker Rolls-Royce revealed first details and images of its new Phantom Coupe for the Geneva motor show next week. Production of the fourth body style derivative to emerge from the BMW-developed Phantom model range, which will be one of the world’s most expensive coupes ever and is claimed to be the most driver-orientated Phantom to date, begins at R-R’s Goodwood manufacturing facility in England from mid-2008. As such, the new two-door Roller will feature a number of “subtle but significant” modifications to differentiate its character from the short-wheelbase Phantom sedan and convertible Drophead Coupe models with which it will share many components. Together, they are claimed to make the two-door fixed-roof Phantom “noticeably more dynamic, whilst still offering incredible levels of comfort”. Among the changes will be a 25 percent increase in fuel capacity over the Drophead Coupe to improve its driving range, notwithstanding the fact Rolls-Royce claims its carryover 338 kW/720 Nm 6.75 liter V12 offers class-leading fuel consumption. As if anyone who could afford this thing would really care; however, they would want to get to the destination without having to refuel constantly. The Phantom Coupe’s rear-hinged “coach” doors (please do not call them “suicide” doors) are designed to improve ease of access to the rear lounge seats, but R-R claim it also improves the torsional rigidity by allowing for an uninterrupted A-pillar. Since you will be getting Jeeves to drive you to the country for sandwiches and champers, there is also what R-R describes as a spacious picnic boot, which offers a relatively tight 395 liters of luggage space and is accessed via a split tailgate - the lower section of which “provides a comfortable seating platform for two adults when lowered”. Just erect the picnic table and bring it up to the tailgate, and pop the champagne cork. The chassis is the same hand-made aluminium chassis used in other Phantom models, including the now five year old sedan, the Extended Wheelbase launched in 2004 and the Drophead Coupe released in 2006. “Rolls-Royce has always been about pace, performance and style,” said Rolls-Royce Motor Cars chief designer, Ian Cameron, attempting to cash in on Jaguar’s “Grace, Space and Pace”. “For the Coupe design we gave the quintessential Rolls-Royce design a dynamic twist. This adds a sense of drama to the outstanding engineering and drivability that are fundamentals of Rolls-Royce cars.” One wonders if the chaps who dream up this verbal drivel actually get paid each month! “A sense of drama” - are they kidding me? 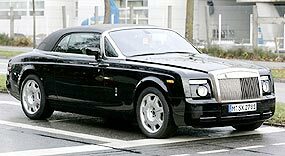 However, Rolls-Royce experienced a 25 percent sales increase in 2007 (31 percent in the Asia-Pacific region), when it sold 1010 Phantoms to easily outsell its most direct rival Mercedes-Benz’s Maybach, which attracted just 401 customers last year. The first Phantom Coupe deliveries for Asia-Pacific customers are slated to begin in the fourth quarter of this year. Price here? Try offering about 30 million baht, but be prepared to haggle a lot. The news has just come through that Ralf Schumacher has accepted a position with Mercedes-Benz as chief crash-safety tester for the marque. After many years in F1, and honing his skills in crash instigation with Toyota, Ralf resigned from F1 last year to take up the new position in the DTM series, driving a C-Class Mercedes-Benz racer. Mercedes boss Norbert Haug has said that initially Ralf will have to get used to starting in the last third of the grid in the DTM formula, apparently conveniently forgetting that Ralf has generally been starting on the back row of the grid with Toyota for the past couple of years. However, with Toyota having finished their crash testing program, they did not beg Ralf to stay when he made noises about leaving them at the end of last year.